To observe a comfort zone which is so vast that it can include men, women and children across four generations is a blessing indeed. This is my experience of last Sunday when I visited the home of Smt. Mankawar Devi Fomra, a Maheshwari great-grandmother married to late Sri Kanhaiyalalji Fomra in Chennai. She is known as Baisa (a term used to refer to mother or aunt) by her family as well as the extended family. I entered a happy living room where the family of seventeen members gathered to meet me. The first thing I noticed was how they were all dressed; it described their attitude, their togetherness and their individuality. 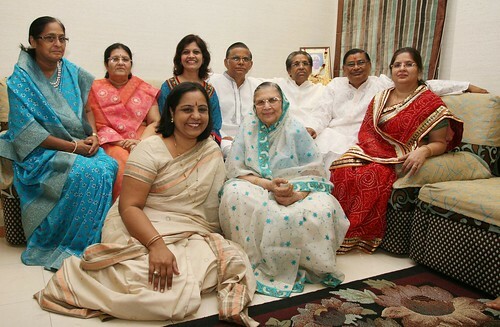 Baisa was dressed in a light-coloured sombre saree; her three sons were dressed in starched white kurta pajamas which is a favourite outfit with elderly Rajasthani men; their wives were dressed in elegant sarees; the grandsons who represented today’s youth were in smart casuals; the grand daughters-in-law wore simple and smart kurtis with understated jewellery; and the children looked all set for a fun Sunday. And what attracted my attention was that there seemed to be nothing deliberate about their co-ordination. Their clothes were symbolic of the unique social structure that they had created around their lives. Each generation stood apart, yet without any sense of competition with another. The young women were not intimidated by the fact that Baisa kept her head covered as is the traditional norm for Rajasthani women. The elders did not mind the casual dressing of the youngsters and the youngsters did not look at the elders as stuffy and boring. All in all, I saw great synergy, as well as space in relationships. 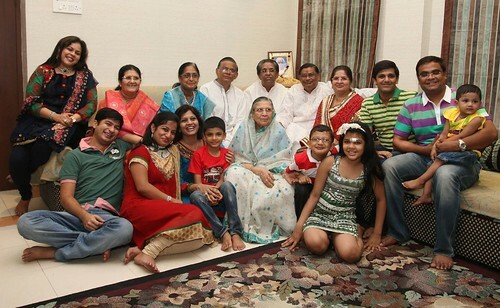 I quizzed Baisa relentlessly, trying to figure out the formula of joyous co-existence in this close knit family. I asked her about rules and rebellion, and freedom and choices. She answered with a quiet and honest dignity. Slowly the family joined in, adding to her views, and also offering insights from their own independent perspectives, in their own voices. Namaste Baisa. A pleasure to meet you. To begin with, where did you live as a child? Baisa: I have always lived in Chennai, my maternal family as well as my husband’s families have lived in Chennai for many generations now. How old were you when you got married? How large was your husband’s family? Baisa: I was thirteen when I got married, that was 65 years ago. There were almost sixty people living at home, and we cooked for hundred people everyday. My husband had seven brothers and ten sisters, and they all lived in the joint family system. Were you intimidated? How did you learn all the housework? Baisa: My mother-in-law and others were very kind to me because my mother had passed away when I was ten years old. So they slowly initiated me into housework. What I enjoyed most was taking care of the cows at home. I have heard much about your kindness and compassion. How have you managed to raise your children by ‘sparing the rod’? Baisa: Being disapproving and strict does not take you anywhere. If nine out of ten things done by the children are fine, then I must ignore the one thing that may not be up to the mark. Kusum Devi (daughter-in-law): Back then, my father-in-law used to have a lot of rules. But with the changing times, our family grew and adapted. Baisa: The younger generation is aware of their boundaries. They never give me any reason to reprimand them. Is the second generation a bridge between yourself and the third generation? 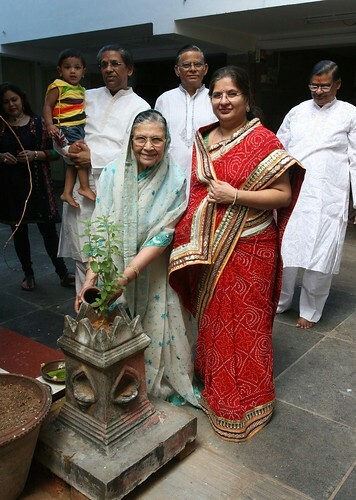 Kirti (grand daughter-in-law): As the Hindi proverb goes, “The interest is always more loved than the principal amount.” So also, Baisa has become more accommodating for her grandchildren’s sake. We are the bridge between our elders. In fact, if we are wearing kurtis now instead of sarees, it is not because we asked for it. It is Baisa who asked us to start wearing what we are comfortable in. Sunderlalji (eldest son): We consider ourselves lucky that the new age has entered peacefully into our house. Pushpa Devi (daughter-in-law): You will be surprised to know that we have three kitchens. One is for preparing offerings for the gods, and for hot beverages. The second is where the main meals are cooked. And the third kitchen is for the youngsters to experiment with fast foods like pizza and pasta. This is where Sudhakar learnt cooking before going abroad for higher studies. I really respect how you all have taken the trouble to create unique spaces. That very much explains how people with different expectations can live together. Sarita (grand daughter): What we have learnt from Baisa is how we can choose to accept the choices made by others. And to find joy in blending our wishes with those of others around us. Kusum Devi (daughter-in-law): She is strict with herself but never imposes any of her rules on others. That in itself becomes something to learn. Baisa: I am particular about certain things for myself. For instance, I prefer to eat in my own house where I know for sure that cleaniliness and godliness are maintained with high standards. I avoid eating or drinking water anywhere outside where the cooking may not have been done with a pure mind. I am now beginning to understand the measures you take to preserve the sanctity of your aura. Baisa, no wonder the people around you feel nourished by your presence. So what happens when youngsters have unexpected demands? Who lays down the norms? Kirti (grand daughter-in-law): If ever we have to go for a club meeting where the theme requires us to dress differently, we just explain it to them and they never stop us. Our elders are quite understanding and permissive, and I have never felt restricted in this house. In fact, the last wedding at our house was a destination wedding and they gave us complete freedom in organizing it. Sudhakar (grandson): I remember when I was in ninth standard, I wanted to go on a school trip. I asked my father who told me to get my grandfather’s permission. But before I could even do that, my grandmother stepped in and convinced them both to send me. Sunderlalji (eldest son): I recognize the use of modern day gadgets like an iphone or an ipad in today’s life. It is not an unexpected demand to want technology that will facilitate your life. In my youth, there were days when a single business transaction would take fifteen days. Now technology has made it possible to do much more in less than an hour. Sharad (grandson): The only rule is that we have to account for the money given to us. However, our family is not built on rules, so we really enjoy ourselves when we spend time with each other. First published in Nov 2012 in Harmony – Celebrate Age Magazine for the column – The Great Granny Diaries. Part-2 of this post is Nagari Laddus, an authentic Rajsathani sweet from the kitchen of Mankawar Devi Fomra. She is the third grandma featured in this column.